Are project managers really needed for IT success? OK, I hope you responded to the poll above and checked the results. Now, it’s time for me to give you my opinion. My opinion, , , , ABSOLUTELY YES!!! 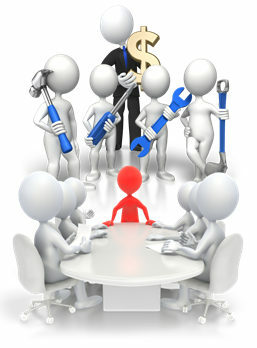 Projects are not successful on their own, , , they are successful because project managers make them successful. Without a project management focus, the tasks that need to happen when they need to happen simply do not get completed without a project manager pushing them along. 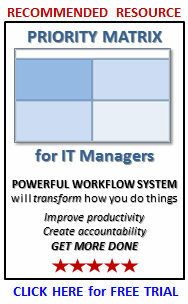 I’m a big believer in placing project management focus on the projects we undertake within an IT organization. To me, it is absolutely essential. Let me back up just a second. Certainly, an IT organization can achieve some level of success without project management focus. Thousands of small and mid-size companies do it every day. However, your success will be limited and exposure for failure is significant, , , especially with large complex projects. So, where does the project management debate occur? What happens is that organizations that apply traditional project management methodologies tend to require quite a bit of overhead, , , too much, in some cases. My sense is that there needs to be a reasonable amount of “monitoring”, “reporting” and “management” when you manage a project. I’m not a proponent that says you need to produce all the reports and do all the things that are defined in PMI’s PMBOK (Project Management Book of Knowledge) or similar resources. I believe it requires too much overhead and administrative time. What I do endorse is that you need a certain amount of structure (methodology) you follow and regularly scheduled status checks to help move a project along. Operations people often do not want to spend the time to meet every week to discuss project status, identify risks, or discuss problem resolution strategies. They just want IT to complete the project so they can get on with their work. This is where the debate happens. How do we manage a large complex project so it doesn’t require an excessive amount of time and administrative effort but is sufficient to do the job, , , i.e., deliver the project successfully? Without the process, odds are extremely high your project is going to fail. “Just doing it” simply won’t be reliable. All of these elements can be accomplished practically and simply, , , without lots of overhead. The point that needs to be made though is that each part needs focus and must be addressed if you want to deliver projects successfully. Delivering projects successfully is critical for your IT organization; in fact it is the key to IT credibility, , , not just the IT organization’s but your credibility as an IT manager as well. That means you need to do things that position your organization for project success. There are two parts in managing scope – defining the project goals and quantifying the deliverables. Being specific about what the project will achieve and what you will deliver is how you manage your client’s expectations. First rule of delivering a successful project is that you must establish realistic and achievable expectations with your client in the beginning before you actually start working on project tasks. If you don’t, you have no chance in delivering the project successfully. In a nutshell, a good project schedule defines what, who and when. It goes without saying that you won’t be very successful if you do not have competent people taking care of the required tasks. Once you identify the tasks required to deliver the project successfully, focus on the people that have the required skills who need to take responsibility for each task. 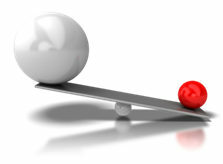 There is a golden rule in IT, , , “Things take longer and cost more than you think they will.” Believe it, it’s true. If you do not have buffer in your budget and project timeline estimates, odds are high that you will either be over budget or deliver the project late, , , or both. Be conservative when estimating project costs and task due dates. You want to position your project team to over deliver. No one gets upset if you complete the project early or under budget. 5. Schedule a Kickoff Meeting to get everyone on the same page. A great way to get the project started on the right foot is to hold a Project Kickoff Meeting with all project members attending. It allows you to set expectations with the project team members, to identify bottlenecks or key risk areas that might prevent project success, and to outline the guidelines for future project status meetings, , , i.e., “come to status meetings with your tasks completed and prepared”. 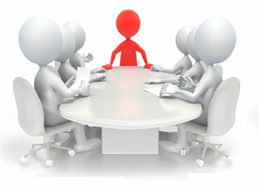 An effective Kickoff Meeting helps you get everyone on “the same page” and started on a positive note. Projects don’t happen on their own. They are successful because project managers make them happen, , , they push and guide projects to the finish line so they are delivered on time and within budget. An important tool project managers use to do this is by holding weekly project status meetings to understand issues that arise, make corrective actions as needed and to push the project forward. You can build a great schedule and budget, but if you do not “manage the project” with regularly scheduled status meetings, the project won’t be delivered successfully. OK, these are what I consider the 6 keys to managing projects successfully, , , but there is a secret component you need to know about. Three of these key elements require strong communication. Unfortunately, IT managers have a tendency to be weak communicators. I’ve discussed this issue many times in prior posts. It’s a very real problem. The bottom line is that poor communication is the root of much of our IT failure. 1. Manage the project’s scope – This requires you to quantify the goals and objectives and spell out specifically what will be delivered to your client so you can gain agreement. It requires you to communicate with your client. 2. Hold a Project Kickoff Meeting – This requires you to communicate the schedule and obtain “buy-in” from all project team members that they can complete the tasks by the scheduled completion dates. 3. Hold regular Project Status Meetings to manage the project – Again, strong communication skills are required to make this happen. My sense is that 70-80% of projects that fail are caused by poor communication and not doing these three key parts just listed effectively. 1. Often, IT people are so eager to start the work on a new project, they don’t spend time to define the scope and gain commitment from their client on the specifics that must be delivered. In many cases, they don’t even take the time to define what they believe are the requirements of a project, , , they simply start working. Doing this will spell “disaster” every time. 2. Another example is that I’ve seen IT organizations stop holding Project Status Meetings and updating the project schedule because “it takes too much time”. Yes, it does require time, but if you fail to monitor and manage the project by reviewing the weekly tasks that must be completed, , , you might as well go ahead and ring up another project failure to your list. Remember, projects don’t happen successfully on their own, , , they are successful only when someone manages the project and pays attention to the details. A big part of this detail work is the communication aspects of three of the six key parts of successful projects that I have laid out to you. If you are interested in a practical resource and tools to help you deliver projects successfully, check out my book, IT Project Management: a practical approach. In an earlier post, I mentioned, “The most important part of creating IT success is being able to conduct a thorough IT assessment so you can determine what your organization needs to work on.” CLICK HERE to view. The second most important element required for IT success is that you must become a credible organization. “Credible”, , , what does “credible” mean? Credibility only comes when your client trusts you can and will do what you say you will do. 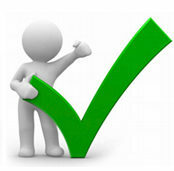 Simply put, it means you deliver projects successfully. You can conduct a great IT assessment and deliver an eloquent strategy that gets lots of acceptance, , , but if you can’t deliver projects successfully, you will not have credibility. 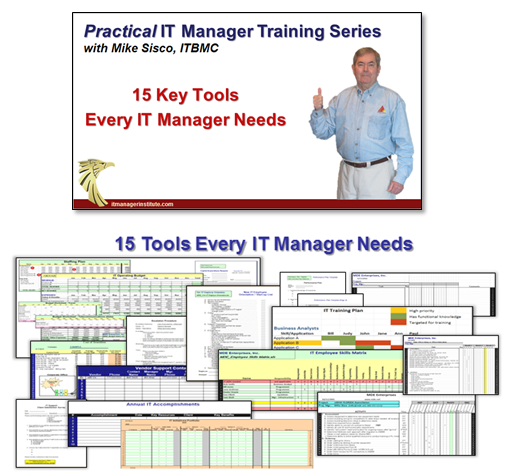 Getting credible is absolutely a requirement to become a successful IT manager at any level. That’s why project management is so important for an IT organization. First, you have to define and prioritize the projects. This happens during an IT assessment. Second, you have to deliver the project, , , this is actually the project management component. Third, you need to track your projects and demonstrate your success rate in delivering projects on time, within budget, and meeting client expectations. All three components are very important. If you don’t identify the appropriate projects to work on and prioritize them so they help your company the quickest, clients don’t think you are focused on the right things. Deliver a project successfully but fail to communicate your success and no one will know about it, , , so it’s important to “bookend” the project work with an appropriate assessment on the front and effective reporting on the back. See my IT Initiatives Portfolio post and download a simple tool to help you quantify and report your project successes, , , CLICK HERE to view. There is absolutely no excuse for failing to deliver a project successfully in today’s world. With the methodologies, tools and training in this area you would think that most IT projects are delivered successfully, , , but to our dismay they are not. 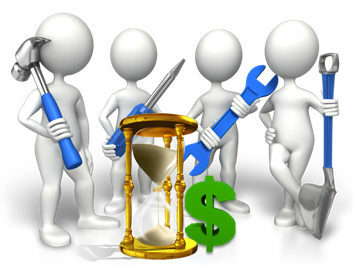 Studies show there is a high failure rate with IT projects, , , year after year. You don’t have to have a PM certification like a PMP to deliver a project successfully, but you do need to know something about project management and it helps to have a few tools. A PM certification doesn’t say you are a successful project manager, , , it says you have knowledge about project management and passed an exam. I’ve delivered hundreds of projects successfully with some of the simplest tools. The key is knowing what to focus on and doing a few key things that positions you to deliver your project successfully. Do these things well and success is achievable. In a future post, I’ll give you my “Tips to project management success”. 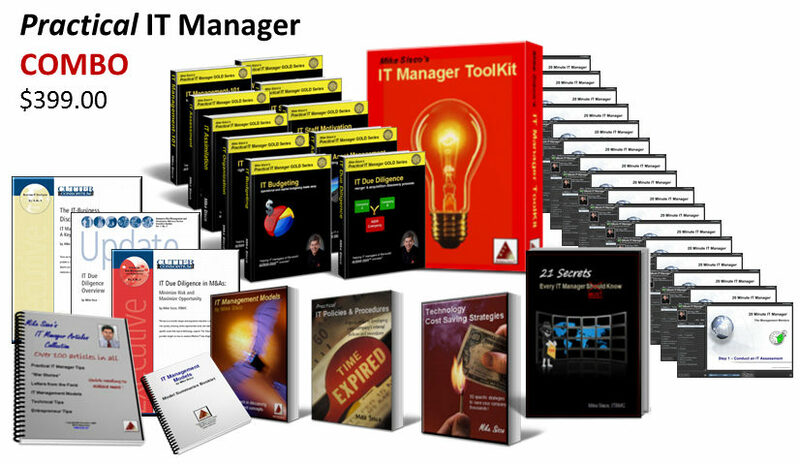 IT Project Management: a practical approach – I wrote this book to give managers a simple and practical process in project management and it includes the tools I use myself to deliver a project successfully. It’s a quick read and gets right to the point. Learn more. TenStep, Inc. and Tom Mochal – The company that provides the most in project management in the world is TenStep, Inc. Tom Mochal has created an international force in providing project management tools, training and consulting services. Check out www.tenstep.com. It is why you should focus quickly on delivering projects successfully when taking responsibility for a new IT organization. Get credible and IT success is just around the corner. Before you think I’ve lost it completely, , , let me explain. In an IT organization, we are there to support the technology needs of people who need technology to do their jobs. In most situations, technology is not the company’s core competency. It is banking services, manufacturing widgets, selling food, clothes, or books, , , or doing something to sell products and services they provide. It is rarely developing technology. 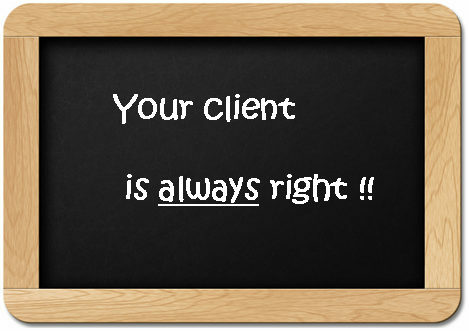 If your clients think you do a good job, , , great. However, if they think you are doing a poor job in supporting their business, , , guess what, , , you are. Let me clarify just a bit. You might actually be doing a super job with the technology. In fact, you could be the best technical organization around, , , the VERY BEST ! However, if the client thinks you are doing a lousy job in supporting them, something is askew. It could be that you are simply not managing their expectations very well. If that’s the case, then there is a problem. Delivering technology services well is not just about doing a good “technical” job. 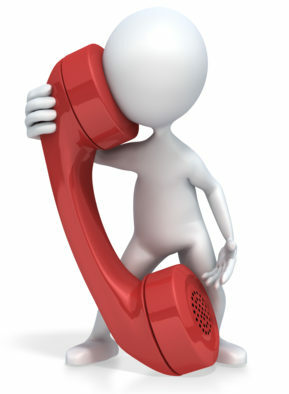 You must also manage the client so they agree you are delivering support successfully. The flip side of this is that you could be doing a mediocre job technically, but if your client thinks you are doing a great job in supporting their business, , , guess what , , , you are. All I can tell you is that I’ve seen many outstanding technical organizations get low marks from their clients because they aren’t managing the client’s expectations well. They may be superior technicians but they are respected less because the client’s expectations are out of whack.